Online retailers had a heck of 2011 holiday season, up 15%. Whew, in a tough economy no less. But the news wasn’t as good for some physical retail stores. Sears Holdings announced disappointing sales and will be closing over 100 stores. 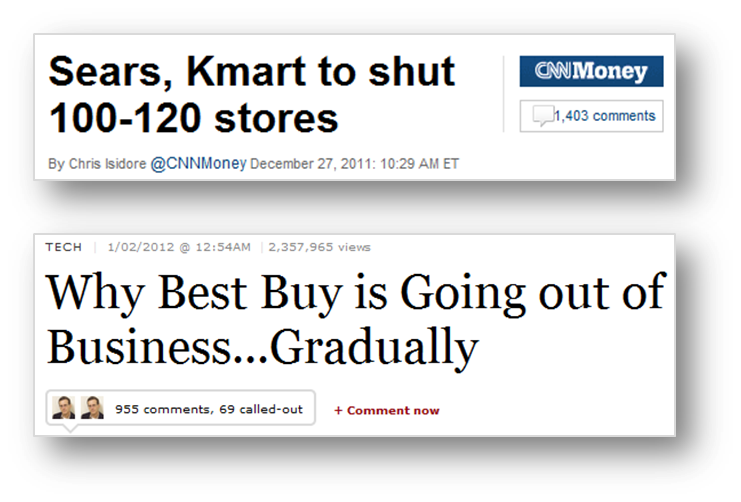 Best Buy same store sales dropped, and some have expressed their sentiment that the retailer is on a long downward slide. Digital disruption. Coming to a store near you. That online and mobile commerce is increasing its share of business really isn’t a surprise. The Internet, as promised in the 1990s, is turning over many industries. Retail being another such industry, although it’s a much slower process of disruption. Which means the physical retailers have time. Time to take their natural advantages and build on them. Given the retail industry’s importance to the global economy and its periodic restructuring, it should come as no surprise that there’s plenty of advice for the industry. Three of the larger, well-known consultancies weigh in. Booz and Co.’s Karla Martin sees a need for retailers to reduce selections and assortments. Bain’s Darrell Rigby sees omnichannel engagement with customers as the path for physical retailers to re-assert themselves. In both Booz’s and Bain’s advice, there are elements of incorporating the jobs for which a customer hires a retailer. In the Booz piece, it’s a curation job: “Help me navigate an increasingly overloaded product landscape!” In the Bain piece, it’s a…well, not entirely sure what job is being satisfied. It appears to combine several customer jobs to be done. It is also a good thought piece about future industry infrastructure requirements. Survey fatigue notwithstanding, McKinsey starts down the right path. Get the customers’ input. McKinsey talks in terms of purchase drivers. An example of such an influence is convenience, deemed to include shopping ease and practicality. But does that go deep enough? The risk here is that only surface-level influences are elicited, while the real drivers are buried deeper. A case of “what they say” vs. “what they do”. A good alternative to get deeper into customers’ minds? The jobs-to-be-done approach. To create a jobs-to-be-done structure, I’ve followed the work of Strategyn’s Tony Ulwick and Lance Bettencourt, and Re-Wired Group’s Bob Moesta. They’re practitioners who have been working with organizations for years. Minimize…the time it takes…to verify the accuracy of a desired outcome…with a customer…e.g. its meaning, completeness, exactness, etc. Bob Moesta has identified four influences on how a customer decides what product will satisfy a job to be done. Push (F1): The situation which is driving a person to seek a solution. What is it we’re dealing with? What’s the impetus? Pull (F2): The promise of a new solution that can satisfy the need. As customer’s consider a new solution, how well does it map to their needs? Allegiance (F3): The familiarity of an existing solution is a risk mitigator, leverages already learned usage and known benefits. 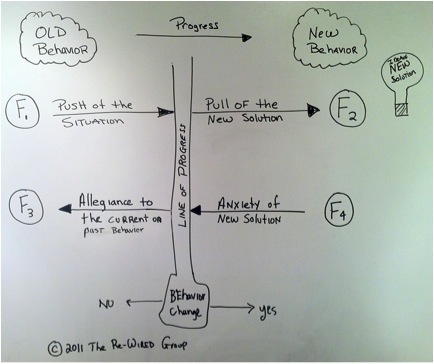 Anxiety (F4): The unknown characteristics of the new solution, and the potential missteps that await. Would if the new solution isn’t all it’s advertised to be? I like both forms of analysis, they are quite complementary. So I combined Ulwick, Bettencourt and Moesta’s work to use as an analytical tool. There are many jobs that retail must fulfill for customers. Below, I’ve picked four of them for analysis. Four that are ones you’d probably see as well. Each job has a defined outcome statement, and a listing of drivers which influence the retailer selected for the job. These aren’t actual customer insights I’ve surveyed, they’re from me. But they address the right type of analysis needed. The analysis is done from the perspective of switching from a physical retailer to an online one. This is the disruption which is occurring. This perspective was chosen to illuminate possible innovations for physical retailers, or to point out the long term trend they will need to accept. Getting the lowest price. Isn’t that what everyone wants? It’s been a human goal since we were bartering woolly mammoth skins for stone weapons. Frankly, this job is one that will be challenging for physical retailers to fulfill. As has been noted, Amazon – and other online retailers – don’t have the overhead of physical stores. They can and do price lower. And you can see the differences, right there, on your screen. The anxieties that consumers feel about online retailers providing this job – retailer performance, shipping delays – are there, but don’t rise to the level of overturning the pull of the online retailers. Too many online retailers have proven themselves over the years. They’ve overcome these anxieties. Physical retailers competing to fulfill this job need scale to overcome their higher infrastructure costs: physical plant, distribution systems, inventory, in-store personnel. Kmart, for instance, is losing the scale war to Walmart, and the online retailers are generally able to outprice it. Verdict: Long term, this job will be fulfilled by mega-stores and online retailers. But only in categories where it makes sense. Groceries, for instance, are tougher for online fulfillment of the Low Price job, due to the delivery costs of home delivery. There’s times when you just have to have something today. Even now. Something needed for a home project. Last minute gift. Car maintenance. The list goes on and on. The Immediacy job occurs when the unforeseen happens, or the unplanned realize they need something. So what’s the pull of online here? Well, you can see the item from your comfortable home. See, it’s right there on my screen! And even better, I can buy it right now! Hmm…not quite the same as actually having it in hand, is it? Actually, the online retailers are working to provide the “holy grail” of e-commerce, same day delivery. There are different strategies here, although working with physical retailers is a core part of several initiatives. But the costs appear prohibitive: one start-up, Postmates, charges $10 to make short deliveries inside cities. Verdict: The physical retailers have a distinct advantage here. That expensive distribution system that hurts them with the Low Price job? It’s a distinct advantage here. Physical retailers should play the immediacy game full tilt. Develop an app that tells customers whether something is available, and make it easy to pay for the item. Create a drive-through pick-up experience. What did Henry Ford say? You can choose any color you want, as long it’s black. That may have been the case earlier in the industrial age, but not so anymore. As a general observation, people desire with the ability to select from distinct offerings when making a purchase. For instance, when buying a shirt, isn’t good to see a variety of colors, patterns, cuts, etc.? You’re looking for something that fits your style. If you’ve got a home repair, don’t you want the right tool for the job? Purchasing for your kids, and it’s great to see smaller sizes of an item. Online retailers can fulfill the Selection job nicely with their ability to provide a long tail inventory. If one retailer doesn’t have what you want, the next retailer is a click away, thanks to Google search and dedicated shopping engines. Online sites can also “own” a category with a larger selection by accessing buyers globally, not just in the local market. Physical retailers have competed to fulfill this job by offering a wide selection of categories (mass merchandisers) or by going deep in a single category (electronics, books, pet supplies, etc.). One advantage the physical retailers have is the ability to hold and touch items, useful when considering a large number of options. Verdict: Physical retailers will eventually cede most of the Selection job to online, due to online’s distinct advantages. With so many options available to us, a distinct #firstworldproblem, it can be daunting to navigate the product landscape. You’ve got a personal style, but could use some help in finding items to match it. There are multiple philosophies for raisi9ng baby, what items fit the one you’re following? Shoppers want information to help them in their purchases. Beyond information, they want advice. Because a low price on something that misses the mark is just throwing money away. The Help job relates to what a products are being purchased for, not for how complex the product is. Online commerce offers shoppers great amounts of information. With a click, detailed product information – the kind not available in-store – can be found. Ratings by other shoppers are aggregated, helping distinguish between good and bad products. Online retailers who can specialize in a more narrow category can offer expert advice. But…and it’s a big but…it’s hard to replicate the give-n-take, the weighing of trade-offs with a live person in front of you. That’s the advantage physical retailers have. There are just times when you really want to talk to someone. Verdict: This is the physical retailers’ job to lose. With local presence and real live people, they’re positioned to do well here. The best opportunities lie in cases where the outcome of the product has a fairly high degree of emotional or monetary value for the customer. Which Customer Job to Fulfill? For physical retailers, the customer job to fulfill should be a natural extension of their strengths. A company’s assets lead naturally to addressing a particular job the customer wants fulfilled. You really can look at industry structure based on the jobs to be done. And see that some long term trends suggest where retail is heading. Keep in mind that a larger set of real customers could well describe the jobs they’re seeking fulfilled. My four above are drawn from own experience. But it’s getting input from multiple customers where this methodology comes alive. I’m sure there are some additional jobs that aren’t being fulfilled very well right now, which are opportunities for the future. I totally agree that the Help Job is the retailer’s to lose. It also calls into question a business model like Best Buy’s that demands that many of the shelves are filled with items that don’t require much assistance around “shaping up the job that the product will do for me as a consumer” (DVDs, Music, Video Games, etc). I also see F4 in the Help Job containing things like. – How do I understand the trade-offs that I need to make when selecting a product? (not MAKING the trade-offs, but understanding what trade-offs exist). – What happens if I pick the wrong product because I haven’t learned enough about the options? I completely adhere to the JTBD approach, and I like the way you’re combining different approaches. One thing that is always risky though is the interpretation applied to a specific industry and applicable to all clients. It is for this reason we do segmentation and use different strategems. JTBD will help you find a grouping of commonalities so that it helps you target your resource use more effectively, but I think ideally you should be doing this for each segment, based on what your go-to-market strategy. We get free delivery here if you spend a certain amount of money, and choose a specific delivery window. We use it for the bulk items, and most non-perishables which does the JTBD of minimizing the inconvenience of doing the heavy lifting from the store to the car to the basement storage. However, the main reason for not getting perishable goods is that it lacks the sensory experience that you get when you choose your ham, apples or whatever, and also because we have the impression the does not take care enough in choosing products with the latest consume by date that would work in our favour. This is where I see retail stores will continue to have an important advantage. One other point I’d like to add to the discussion is value in use. Branding has traditionally been used to reduce risks (by building reputation) and now peer-to-peer support helps mitigate these as well through information, opinions, shared experience and assistance. I think there is a real opportunity for retail stores to help in broader tasks than just provide a convenience outlet for products – such as by looking how they can help their customers in their broader jobs. As an example, I am not looking for a particular diet food product because I want to lose weight, my overall goal could be that I need to get food for my family for the next two weeks, I want some variety so I’m looking for different menu choices and it would be good that it is healthy. A retailer could look beyond the physical store and help them online and offline and in this manner prepare the next visit to the store – and maybe even stick together a shopping list with alternatives to guide the customer. Thanks Mark, I’m with you. Jobs-to-be-done is the way forward. You’re right about the specific segments vs. applicable to all clients. As you note, even groceries can be done through e-commerce, at least for dry goods, of a minimum total basket amount. Indeed, we use Costco a lot here in the States for those dry goods bought in larger quantities (and higher dollar amounts). My writing here is a start, but I’ll concede I can’t know all the possible jobs that need to be fulfilled. I’ll still argue that long term, low cost is either a mega-scale or online game. Retailers like Kmart are getting squeezed as being betwixt and between. If Kmart isn’t fulfilling low cost, or conveninece, or selection, or help,…what job are they addressing? And both you and Chris (comment above you) note that the Help job is a glaring need. I think so too. A challenge for brick-n-mortar retailers is to provide the help and retain the sale. It carries some risk of people enjoying the help, but then going online to buy something low cost. Not a show stopper, but an issue that would need to be addressed. And yes, let’s keep it going.